Ganesha the Divine: The old temple was consecrated on Thursday, 19th November 1801. According to our Hindu Calendar it falls on Kartik Shudha Chaturdashi, Shake 1723 in “Durmukh Sanvatsar”. It’s build-up area was 3.60mtr. x 3.60mtr. square. It was ground floor structure. It had 450mm thick brick walls and old type dome, again of brick with a Kalash above. Around the dome, a parapet walls with grills was structure of the temple. The floor level of the temple and road level were also same. This temple is on the corner of Kakasaheb Gadgil Marg and S.K.Bole Marg in Prabhadevi, which is facing heavy vehicular traffic It was built by a professional contractor, Late Mr.Laxman Vithu Patil as per the financial support and instructions of Late Mrs.Deubai Patil, who was a rich lady of Agri Samaj from Matunga. Although she was rich enough, she had no child.The idea of the construction of the temple struck to Late Deubai during the prayer time, she humbly requested Lord Ganesh and said, “Although I cannot have a child, let other ladies who are childless get the pleasure of child on visiting the temple and praying you”. Looking at successful subsequent history of the temple, it appears like the Lord Ganesh nodded to this humble request and pious thoughts and deeds of Late Deubai Patil. It is, therefore, this Siddhivinayak is famous for it and known as “Navasacha Ganapati” or “Navasala Pavanara Ganapati” in Marathi (Ganapati bestows whenever humbly genuinely prayed a wish) among devotees. The idol of Shree Siddhivinayak was carved out of a single black stone and is 2’6” (750mm) high and 2′ (600mm) wide with the trunk on the right. This is rather unusual appearance of Lord Ganesh. The upper right and left hands hold a lotus and an axe respectively while the lower right and left hands hold a rosary (japmala) and bowl full of “Modak” respectively. As it resembles the sacred thread, a snake appears on the left shoulder to right side belly. On the forehead of deity is an eye, which almost looks like the third eye of Lord Shiva. On both sides of the Lord Ganesh idol, are placed one idol each of Riddhi and Siddhi goddesses who are appearing like peeping out of the Ganesh idol from behind. 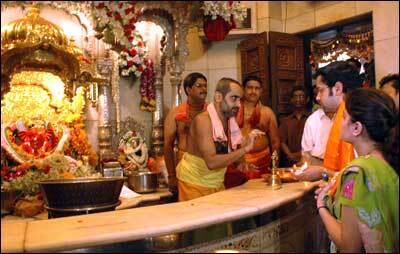 Because of these two deities along with Lord Ganesh, this temple is known as the Siddhivinayak Ganapati Temple. These goddesses signify sanctity, success, wealth and prosperity. Around 125 years ago, Shri Akkalkot Swami Samarth’s great disciple, Late Ramakrishna Jambhekar Maharaj, who was also ardent devotee of Lord Ganesh and Gayatri Mantra was blessed with Assyssinian ( Siddhi ). One day Swami Samarth asked Shri Jambhekar to bring divine idols. Out of the idols, except two idols, Swami Samarth told to bury in the front courtyard of the house of Swami Samarth’s another disciple Shri Cholappa, where Swami Samarth used to temporarily reside. 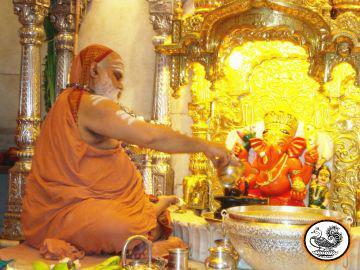 Shri Jambhekar was also told to inhume remaining two idols in front of Lord Ganesh that he usually worshipped. During his attendance with Swami Samarth, Shri Jambhekar foretold that a Mandaar tree would grow on the place after 21 years, Swayambhu ( Swayambhu ) Ganesh would appear on the sacred place. From that onward people’s devotion would grow in leaps and beyond. After few years, Jambhekar Maharaj whose Math is near sea-shore at Dadar, Mumbai, asked Late Priest Govind Chintaman Phatak to look after, perform regular religious pooja etc. of Shree Siddhivinayak Temple. The predecessor of Priest Phatak, there was Late Namdev Kelkar performing priest-wood job in the temple. From the available information and records, the land of the temple complex was around 2550 sq.mtrs. There was a lake towards eastern and southern side of temple admeasuring approx. 30 x 40 sq.mtrs. This lake was built by Nardulla in early 19th century, to overcome the scarcity of the water, faced by the area. The lake was, later on, filled up, and now it is playground and a part of Kakasaheb Gadgil Marg. There was also a rest house, sought of Dharmashala and a pair of beautiful 3.6 in high, stone masonry “Deepmalas”. There was also a dwelling unit for the owner of this complex. In the earlier days when there were not many structures of residential and commercial type in its neighborhood area. The devotees in large numbers started visiting the temple only after 1952 and the long standing Q’s were seen in 1965 onwards. Since the owner had divided the original plot and subleased it to different parties and naturally the space available around this old temple reduced and became quite small. After 1975, the number of devotees visiting the temple started growing by real sense of Geometrical Progression. It became difficult to enter the temple or even to have “Darshan” of Lord Ganesh, the devotees were finding it quite troublesome to enter through the two small doors.